The aim of the present study was to analyze the prevalence of the perception of problematic Internet and smartphone use in young people over the period 2006–2017. To this end, a questionnaire on Internet use habits and two questionnaires on the negative consequences of Internet and smartphone use were administered to a sample of 792 university students and the scores were then compared with the results of former studies that had used these questionnaires. The frequencies of Internet uses are shown in Table1. The most frequent activities on the Internet were checking emails and sending messages, participating in social networks, and listening to music. The least frequent uses were gambling and visiting adult pages. Significant gender differences were found between all uses except for online purchases, viewing of TV series, movies or videos, and administrative tasks. Descriptive statistics of the CERM and CERI scores are presented in Table 2. The mean CERI score was 18.04 (SD = 4.50), and the mean CERM score was 15.77 (SD = 3.50) for the whole cohort 6. There were no significant differences neither for gender nor for the different major degrees (F(4, 787) = 1.24; p = 0.291 for the CERI, and F(4, 787) = 1.85; p = 0.116 for the CERM). To the question, “Do you think girls are more addicted to the Internet than boys?” 73.2% answered affirmatively. Regarding the self-assessment of whether they considered themselves addicted to the Internet, 375 students (47.4%) either agreed or strongly agreed with this statement. People who “strongly agreed” with the statement “I am addicted to the internet” obtained significantly higher results than the rest of the participants on both the CERI and the CERM. The correlations with the CERI and CERM were 0.38 (p < 0.001) and 0.34 (p < 0.001), respectively. The comparison between the present study and former studies with CERM and CERI shows that the scores on the CERI and CERM grew from 2005 to 2013 and remained stable as of the 2013-14 academic year. The number of students who showed problematic Internet use went from 1.5% in 2005 to 6.4% in 2017 and from 0.6% to 3.0%, in the case of problematic mobile phone use. The correlation between CERI and CERM was “moderate” up to 2014 and increased to “high” as of 2015. 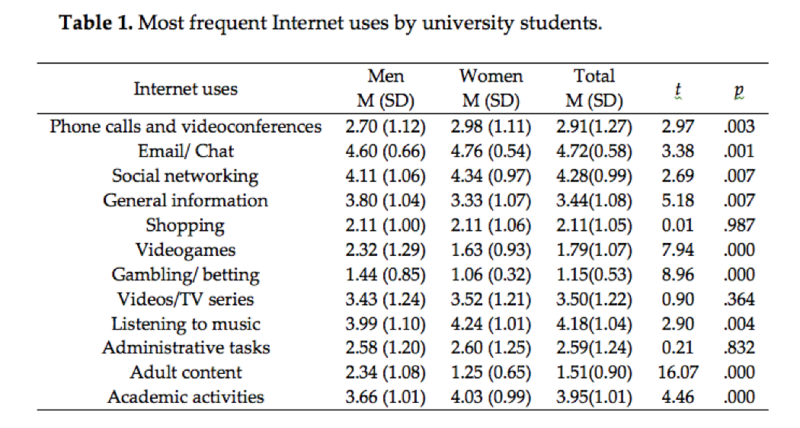 The increase of the perception of problematic Internet and smartphone use was stronger for females than for males, but as of 2017, both sexes had lower scores and tended to present the same degree of negative effects. Although men and women use the Internet differently, their problematic use of the Internet and mobile phones are quite similar. In university students, the use of social networks is the main factor responsible for the perception of problematic use, a casuistry that has increased in the decade 2006–2016. Despite the limitations of the CERI and CERM, estimating the prevalence at different points in time offers valuable information about the evolution of the perception of problematic Internet and mobile phone use. The degree of agreement with the statement “I am addicted to the Internet” might be used as a screening question for the problematic use.